South Dakota. I really have mixed feelings about South Dakota, both the state and the quilt block. We actually spent quite a bit of time in South Dakota on our trip west, and it was lovely: Badlandlands National Park, Custer State Park, Wind Cave, Mount Rushmore. But the heavy sustained winds all night long finally broke our tent pole, which was a pain to deal with. 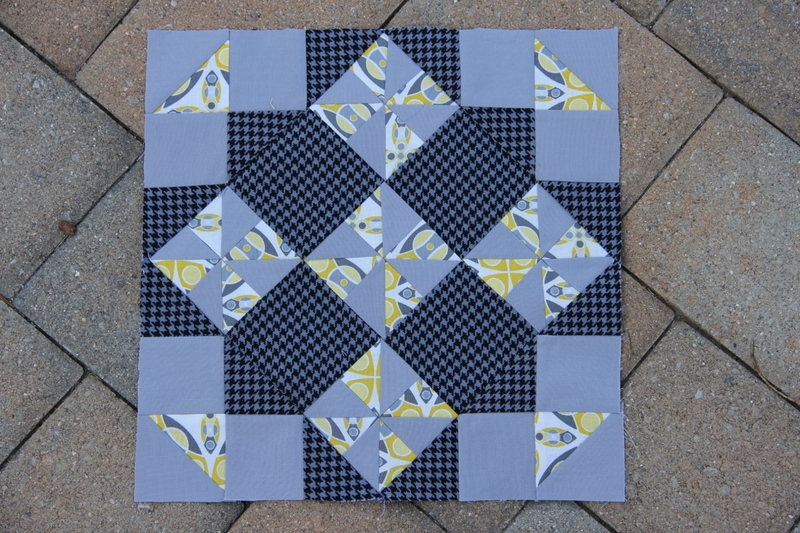 The quilt block is a little complicated because of the on-point center 9-patch portion. 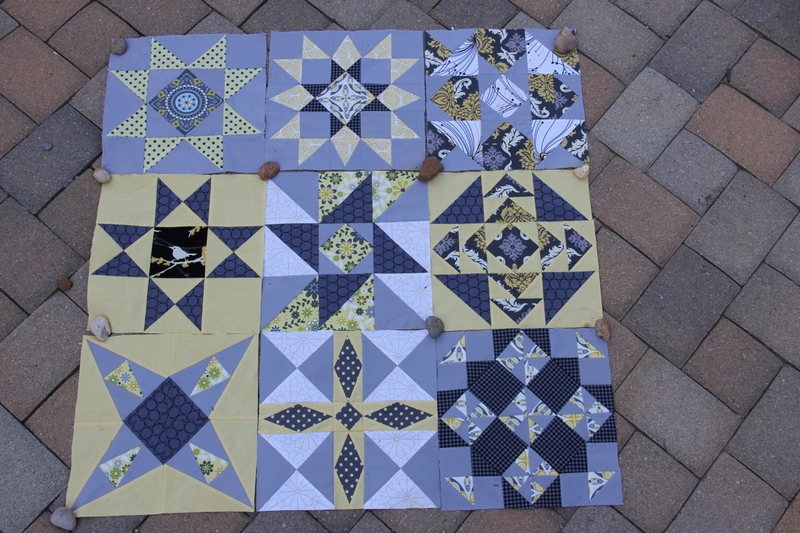 I posted about my difficulties figuring it out, and my mom linked to the directions on bellaonline, which is where I found the block originally. Those directions do make it seem a little more simple than it is. Or maybe I’m just a little bit of a perfectionist, but I did the math: Pythagorean theorum, square roots, seam allowances and all. 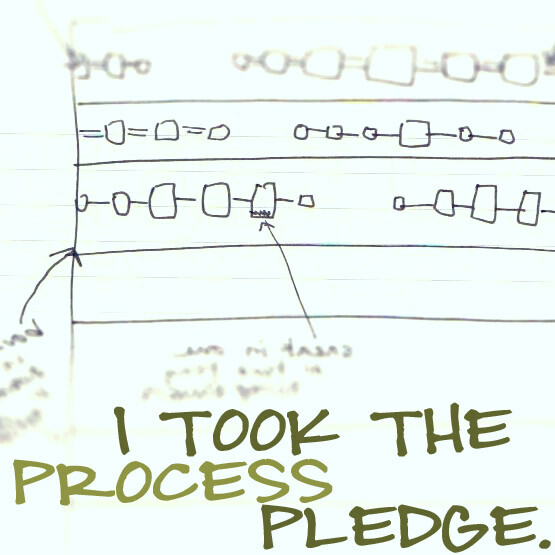 I did the math, though, so that means you don’t have to! Hooray! I actually made this block twice (Grrrr). 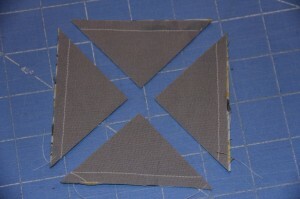 That center square finishes at 8.5 inches and I trimmed it to 8.5 inches and didn’t leave room for seam allowances. 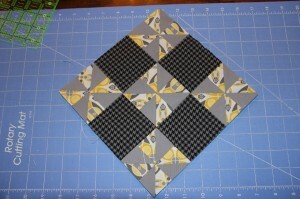 Then I didn’t realize it until the block was all put together and too small! Note: trim center 9-patch to 9 INCHES!! Construct the center 9-patch block. We are going to try a new method of half square triangles, which we will use to make the pinwheels. 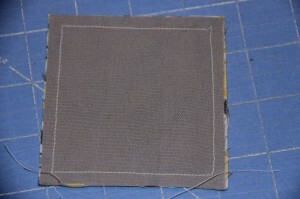 Place 1, 3.25-inch square of background fabric, right sides together with 1, 3.25-inch square of fabric 2. 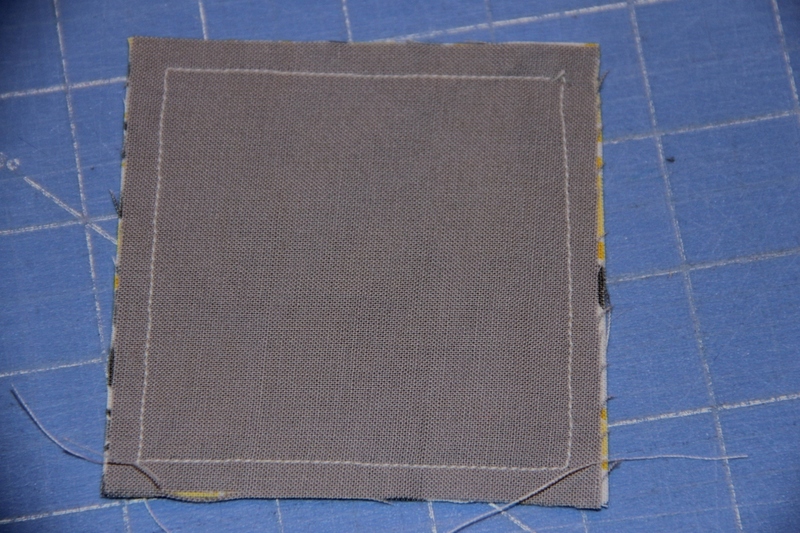 Sew a line all the way around, a scant 1/4 inch from the edge. Cut 2 diagonal lines across the piece you just sewed together, splitting it into 4 triangles. 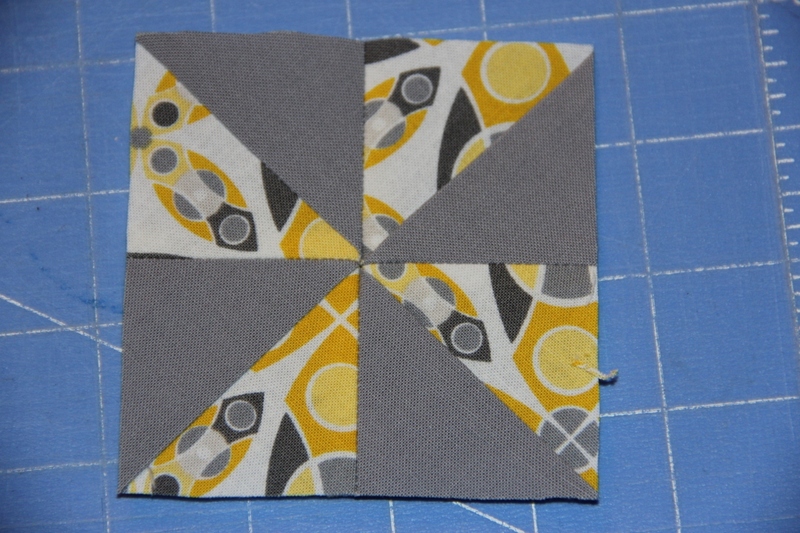 Sew the 4 squares together into a pinwheel. 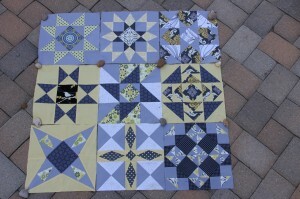 Repeat with the remaining 3.25-inch squares to make 5 pinwheels in total. 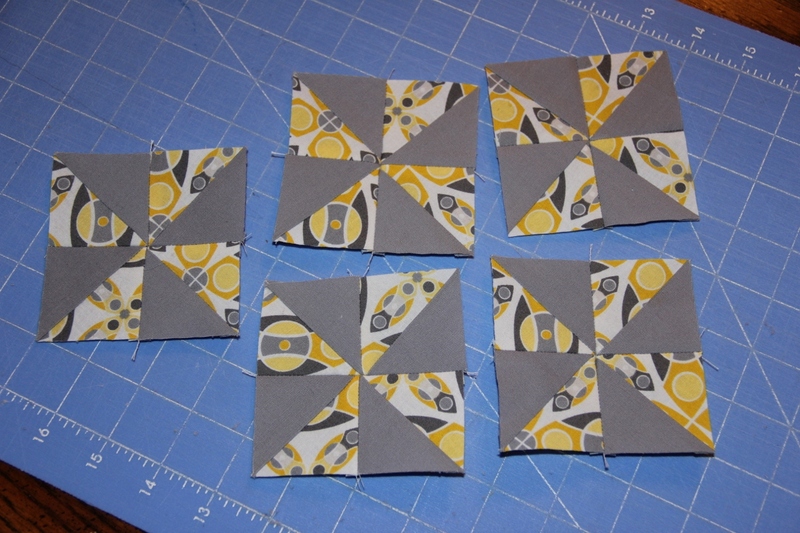 Because of how you trimmed the half square triangle pieces, your finished pinwheels should be 3-3/8 inches, square. 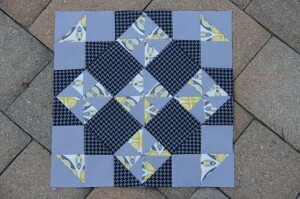 Alternate your pinwheels with the 3-3/8 inch squares of fabric 3 to create a 9-patch block. 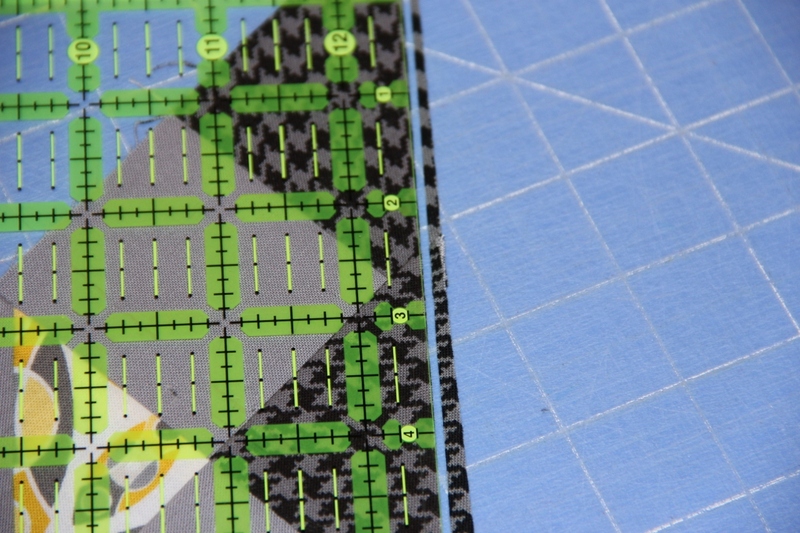 Trim the entire 9-patch to 9 inches, square. Each of the 4 corners is constructed in the same. 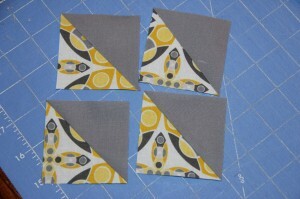 We will start by making some more half square triangles for the corners, this time using the more traditional method. 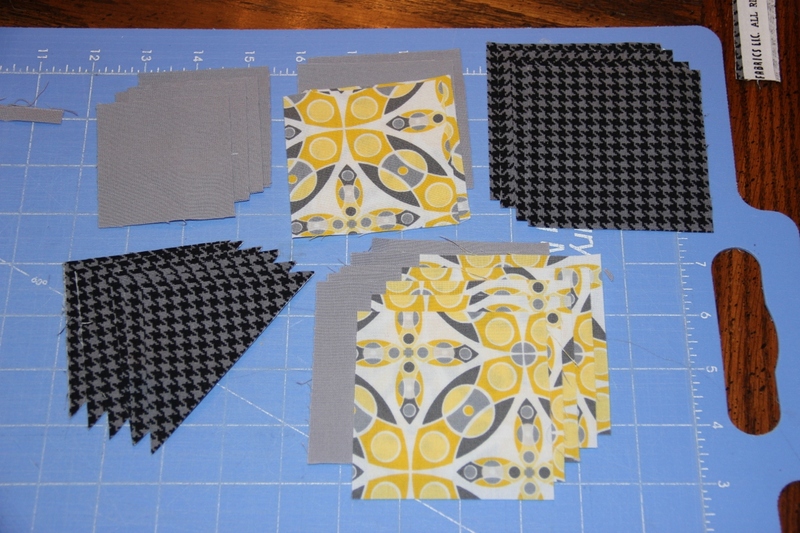 Place a 3-inch square of background fabric and a 3-inch square of fabric 2 right sides together. Draw a diagonal line from corner to corner. 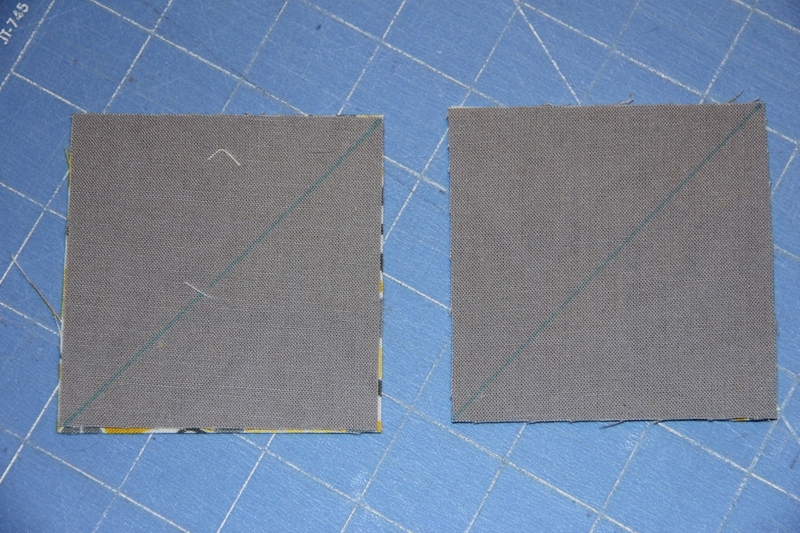 Sew a line of stitches 1/4 inch to each side of the line. Cut the squares apart on the line you drew. Iron the pieces open. Trim to 2.5 inches. 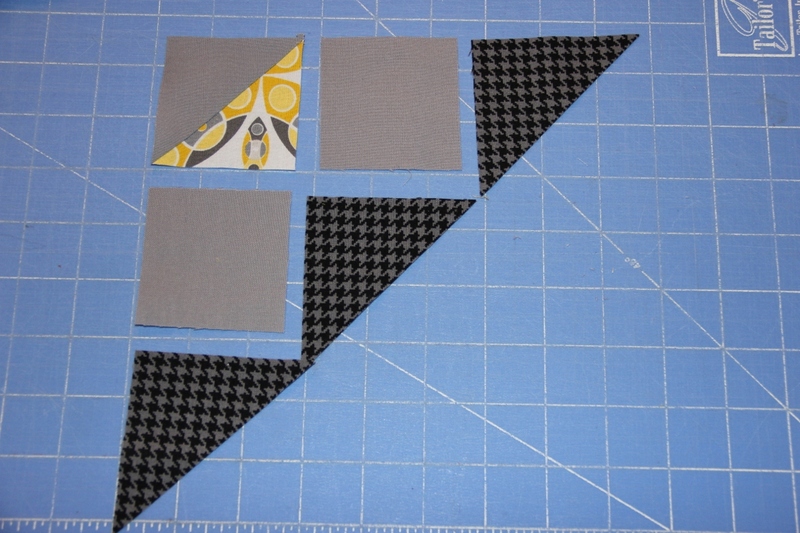 Lay out your corner sections as shown below. Sew the pieces into rows. 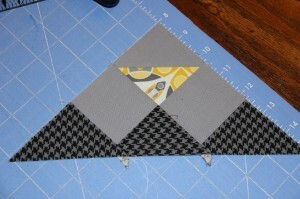 Then sew the rows together to make a large triangle. 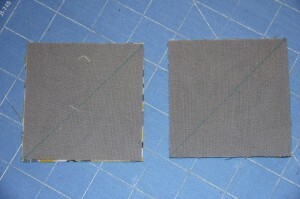 Trim the longest edge of the corner piece so that it is 1/4 inch beyond the points of the squares. 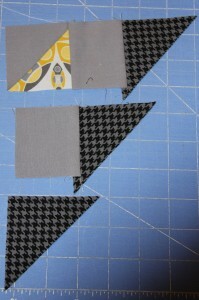 This will help you line up the pieces when you sew them to the center. 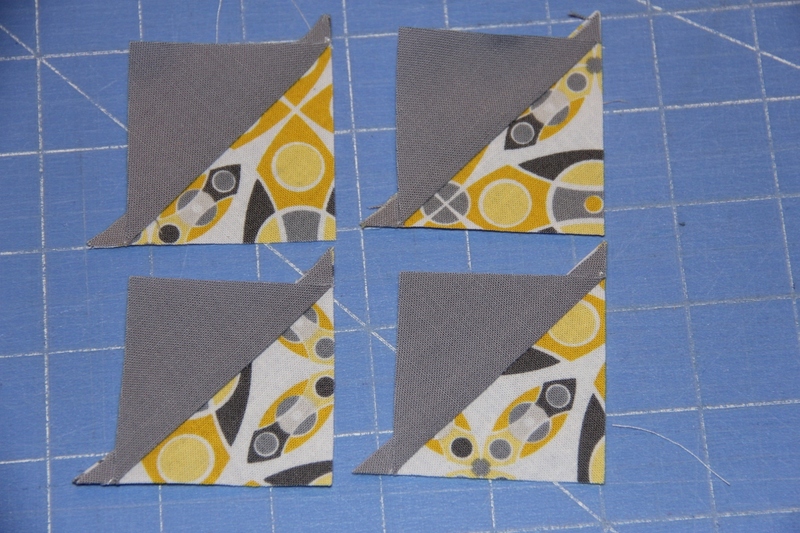 Arrange the triangles around the center 9-patch piece. 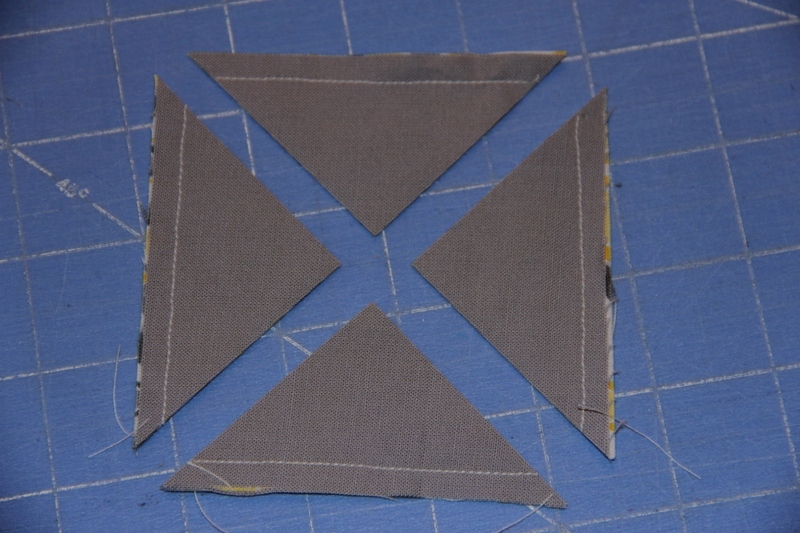 Sew two opposite sides to the center square. Iron them open, then sew on the two remaining sides. 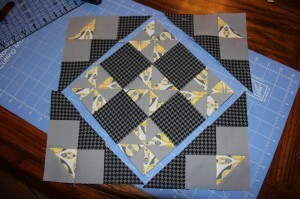 Trim the block o 12.5 inches. With 9 blocks, the quilt right now would make a nice sized baby quilt. 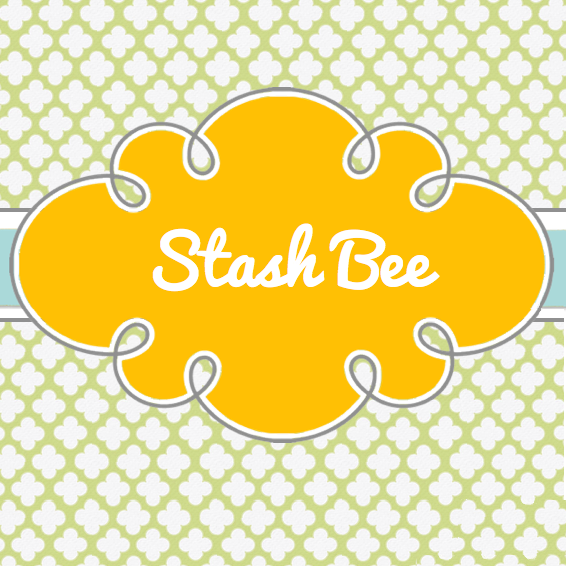 Just add sashing between the blocks and a border! Five states to go until our road trip is complete! Just have to say that this is my favourite block you’ve made from your road trip so far. It looks well worth the effort! O-o-o-o, Emily! I can’t WAIT to do this block. I LOVE yours. I’m glad I’m not the only one who keeps screwing up the measurements!